Authorities in the central and central highlands region need to prevent flash floods and landslides which caused by prolonged heavy rains, issued the National Center for Hydro Meteorological Forecasting. Yesterday, the provinces of Thanh Hoa, Nghe An, Quang Binh, Dak Lak, Dak Nong, Kontum experienced heavy rains. 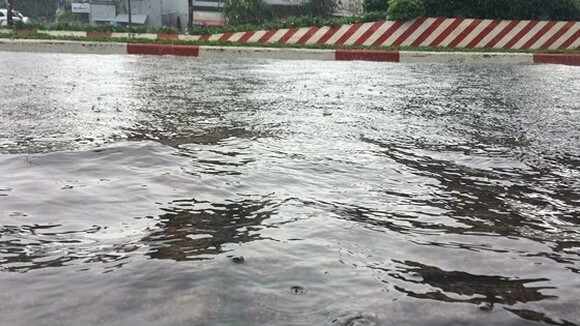 Due to the impact of east north monsoon, prolonged heavy rains continued hitting the provinces of Nghe An, Ha Tinh and the north part of Quang Binh on September 8 to 9. Flash floods and landslides could appear in Muong Lat district (Thanh Hoa province), Ky Son (Nghe An), Ky Anh, Huong Son, Huong Khe (Ha Tinh), Tuyen Hoa, Minh Hoa, Bo Trach (Quang Binh), Kon Ray, Dak Ha (Kontum), Hak Doa, Chu Pac, Mang Yang, Chu Se (Gia Lai), Buon Don, Cu M’gar, M’Drac, Krong Ana (Dak Lak). The east north monsoon causing heavy rains also hit the central rgion while the central highlands region experiences rains by west south monsoon . On the other hand, a typhoon named Mang Cut (Mangosteen) is heading to the Philippines and the Asia Pacific forecast ceter, typhoon will gain strength and be able to make landfall in the East Sea on Saturday next week.